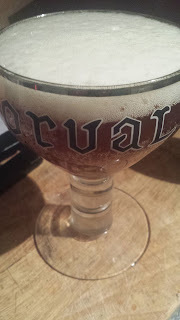 The trouble with brewing with the Orval Brettanomyces is that it's a complete beast. The first time I tried brewing with it it pulled on it's hobnail boots and trampled over all the other flavours I'd tried to get in the beer. It seems to me to brew successfully with it you need to limit its growth as much as possible or the beer will become unbalanced. Mash at 60°C so there's maximum fermentability for the primary fermentation with Saccharomyces. Include a large proportion of 100% fermentable sugar for the primary fermentation. When bottling the beer pitch 99% Saccharomyces and 1% Brettanomcyes for the secondary fermentation. Apparent attenuation is over 90% before the Brett. is added, though it does get to 100% after the secondary fermentation. Armed with this knowledge my latest attempt at making an Orval like beer had a long and low temperature mash, with a very small Brett. addition on bottling...and it worked! I got a crisp tasting beer with a touch of funk and no nitrogenation. I'm rather pleased with this one. It takes a bit of the crispness out of the beer if you ask me though. I think this will end up getting posted to milk the funk facebook group :). Thanks, I'm on that group so I'll post it there now. How long did you condition it for? Would you expect the head to grow to Orval's more monstrous proportions with time? Or do you think the nitrogen somehow increases the quantity as well as the smoothness / bubble size? That picture is from about five months after bottling. I'm sure the nitrogen does increase the size of the head as I doubt you'd get a monstrous head like that without dabbling in the dark arts.